Maggie Finegan formed and leads the Move with Maggie Team at Keller Williams Realty. Maggie serves as lead listing and buying specialist. Maggie works to assure that she never misses an opportunity to show your home. We work closely with attorneys, professional home stagers, licensed home inspectors and provide referrals to a home professionals to prepare your home for sale – from painters to plumbers. Leveraging systems, technology and social media to showcase your home, the Move with Maggie Team is supported by Patty Sanchez as Marketing and Transaction Manager. She monitors the sale of your home every step of the way to assure a smooth transaction from sales contract to closing. Patty also provides systems and financial oversight as Executive Assistant. 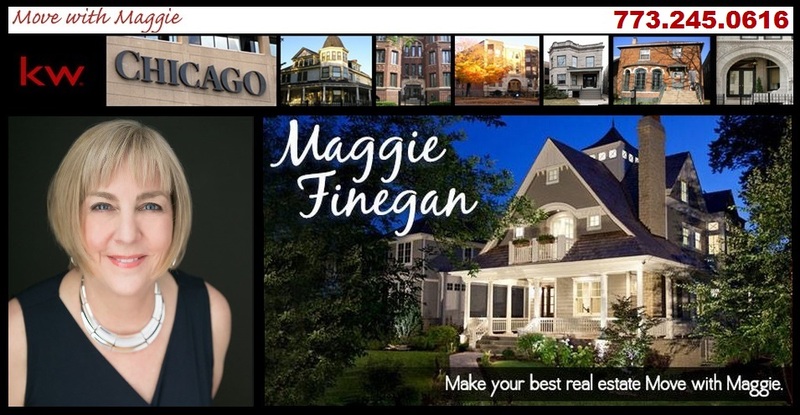 A full time realtor since 2002, Maggie and her team sell real estate in all 77 Chicago neighborhoods and the surrounding suburbs. Maggie has sold over 220 properties valued at more than $70 million since the beginning of her real estate career. She ranks in the top 5% of members of the Chicago Association of Realtors and is designated a 5 Star Realtor by Chicago Magazine each year since the awards’ inception in 2010 based on independent research and interviews with clients. Specializing in working with busy people, professionals and executives, Maggie and her team provide over the top client service and, as a result, 95% of our new clients are referrals from our highly satisfied clients. Maggie brings 25 years experience in client service and corporate marketing. Formerly, Maggie marketed the professional services of bankers, CPAs and attorneys. Past positions included project manager for IBM’s Center for Internet Marketing, Director of Marketing for the Illinois CPA Society and the Dykema Gossett Rooks Pitts law firm. The Move with Maggie Team enjoys selling all types of property from condos to homes to income properties as well as luxury homes and resort properties. Maggie and Andrea are Accredited Buyers’ Representatives. Maggie is certified by the Institute of Luxury Home Marketing and holds holds additional certifications in social media and internet marketing. Maggie serves the real estate community as a member of the Chicago Association of Realtors‘ Education Committee and on the Agent Leadership Council (Board of Directors) of Keller Williams Realty. A 20 year resident of Andersonville, she serves on Board of Directors of the Andersonville Development Corporation. Maggie is also a member of the Lincoln Square/Ravenswood and Andersonville Chambers of Commerce. She supports the Keller Williams Cares initiative. After moving to Chicago in 2010, Andrea became actively involved in volunteering at Annie’s Legacy, a small non-profit organization that supports survivors of domestic violence and helps them start or advance their careers.